When you are buying a used prestige car it is important to consider the dealership you are buying from and whether they can sell you a luxury car that is more than just its badge. If you choose the wrong car dealer, then you could end up with a car that gives you problems with no obvious solutions other than to throw your own hard earned money at the problem, so it is imperative you use a dealer with an in-depth vehicle check, such as Hippo Prestige. Hippo Prestige is very proud to be able to say that all our prestige and luxury cars for sale are prepared to top class specifications so you know that when you buy an approved used or second-hand prestige car it is because it is the value purchase you can make. How do we ensure our cars are prepared to top specifications? Hippo Prestige, as part of Hippo Motor Group, is a one-stop-shop capable of preparing every single car that passes through its showroom, whether it is an executive car or a supercar. This is thanks to 200 skilled staff that are experts in everything from buying through to preparation plus repair and providing suitable finance and on-going support. Car quality is paramount at Hippo Prestige. It’s why we developed our comprehensive 124 point vehicle check which is there to protect you and us when we purchase a prestige vehicle and get it in tip-top shape for you. We also realise that it’s all very well saying that we have a 124 point check but what does it actually entail? Firstly, many providers of Prestige vehicles simply rely on the fact that modern cars are less likely to go wrong and have the briefest of a preparation process before the vehicle is put on sale. This can be a fatal error as while it is true that they are more reliable in terms of engines, these still can have minor issues which can turn into major ones if not caught early and bodywork and interior trim still have exactly the same challenges if not more where cars are getting more and more electrical, communication and infotainment capabilities. By way of example, consider that a new headlight on a modern, prestige BMW or Mercedes can cost nearly £2,000 to replace and you can see that it pays to be extra vigilant and checks need to reflect this is you want to avoid the chance of a very expensive error. Everything needs to be checked so what do we go over with a fine tooth comb? The first thing that happens is a visual health check where our assessors are trained to spot each and every issue on the inside and outside and the degree of the issue such as minor, advisory or needs urgent attention. Our specialist mechanics and body assessors are trained to spot even the smallest scratches, dents, chips and rust and then they move onto the less obvious things that could need attention on the car. What do they look at specifically? Tyre condition including inner, middle and outer tread depth for all tyres. You can’t see all issues just by checking a stationary car so our assessor then takes the car for a pre-prep road test to identify if there are any other issues. Any issues, large or small are then marked down. If there are serious issues then these are marked urgent and, while unusual- because we have experienced and expert buyers, we have rejected vehicles at this stage and simply send them for auction without entering them into Hippo stock or the prep centre. We don’t compromise on the quality of the car. 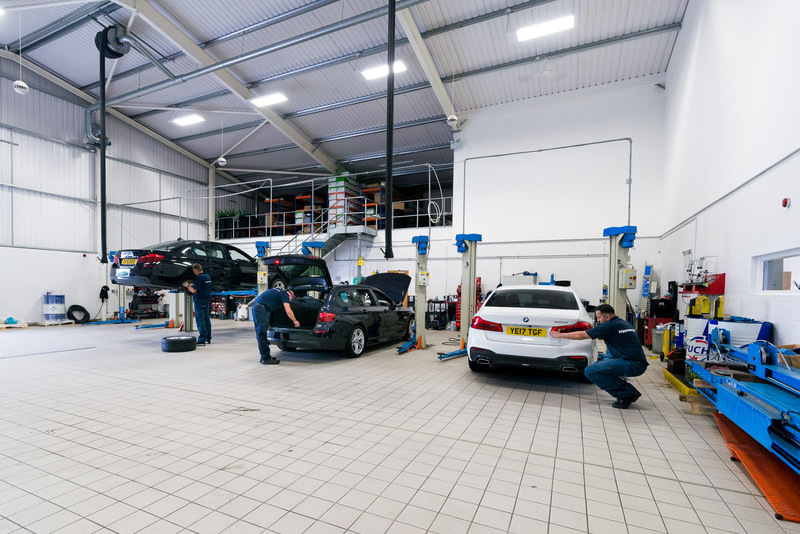 Once the thorough assessment is complete, the car then goes into the workshop and body-shop to return the car to tip top condition and we have experts from mechanics that work with every type of conceivable vehicle through to body shop experts from painters through to trim experts. We even have a specialist vehicle tailor to fix any small blemishes on leather or stitching. It’s one thing to have experts but they need the right kit and materials to ensure a fantastic job and Hippo don’t stint here with state of the art equipment from multiple hydraulic lifts through to state of the art spray booths and alloy diamond cut machines plus the best consumables like top quality oil and fluids. The complete prestige vehicle then goes through a final road test before our dedicated (and independent) quality assurance team do a final assessment before sending the vehicle to our 20 strong valet team that make sure everything is clean and tidy. While we can’t make a used prestige vehicle new again, but we certainly try with our thorough assessment and preparation and that is the backbone of our 124-point vehicle check. Every car that goes out from Hippo has a warranty with it, be it the balance of manufacturer’s warranty or our complimentary Platinum Warranty. Call one of our prestige account managers today on 01254 916450 or email us on info@hippoleasing.co.uk for friendly, knowledgeable and helpful advice on both Prestige cars and finance.